The color combination on this is really lovely. Very Very Nice Wall...ThankS For Sharing! The color combination, background and her expression are just so compatible, it's perfect. 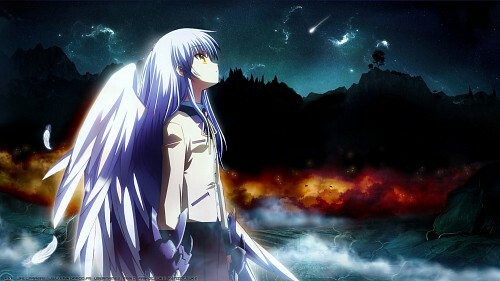 thanks 4 the wallpaper.... Kanade looks kind a cute! I think it won't be an overstatement to suggest that this the best "Angel beats" wall so far; created in dark and rich colours it is very fitting desktop, ??????? kanade daisuki! thanks you very much for this wallpaper!